Beyond the overstuffed floral sofas, past the assortment of porcelain milkmaids and ceramic puppy dogs, there was a scuffed old desk pushed up against the wall. The tiny old lady gingerly pulled out the chair and perched herself on it, gesturing for my uncle and I to take a seat nearby. She was my uncle’s dearest patient, and he had brought me along on a house visit to meet her. Carefully, she pulled open a draw and held out a plastic tube, paper thin skin stretching over arthritic knuckles as her hands curled around it. Peering into the container, my eight-year old eyes widened in delight. Eggs of all sizes were nestled in together. They twinkled in their colourful foil wrappers, unlike anything I had seen before. ‘Pick one’ urged my uncle. I snapped out of my bewilderment to choose a bright blue one, about the size of a chicken egg, and unwrapped it slowly. A cobblestone chocolate surface was revealed as the soft foil fell away under my eager fingers. The hollow centre was a real surprise, and there was something about that thin chocolate shell, perhaps the way it just seemed to give way on my tongue, that did it for me. I’ve been weak at the knees for Easter eggs ever since. Those first few months after we migrated to Australia are mostly a blur, but there are certain memories, like this one that linger vividly within the childhood section of my mental filing cabinet. The lovely old lady is long gone. But that little girl’s first taste of a chocolate Easter egg, sitting in the living room of her uncle’s favourite patient, is never to be forgotten. These eggs were a happy accident in my quest to create a low-sugar creme egg. While they are not quite what I envisioned, they are a stepping-stone towards a creme egg, and turned out too good not to share with you. 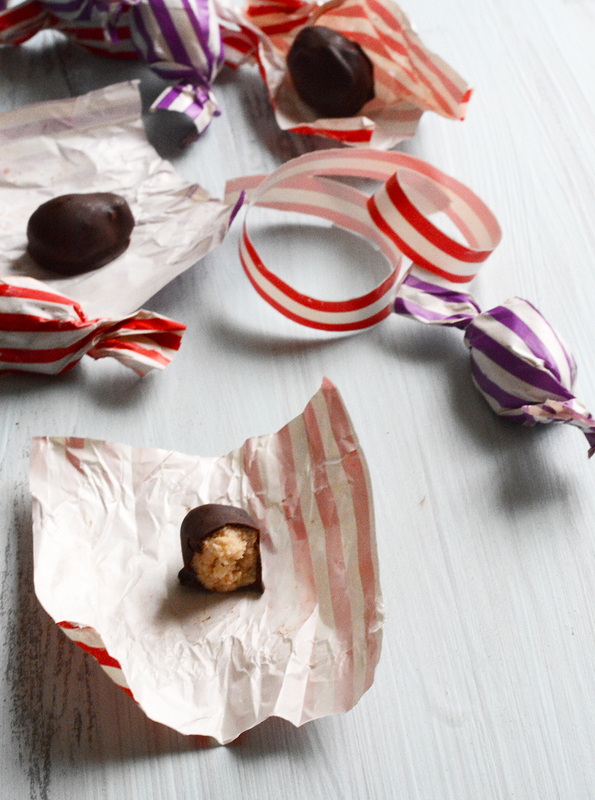 The centres of these are creamy, albeit a bit too firm to call them a creme egg. They have a natural sweetness provided by the nuts and boosted by the tiny amount of sweetner, which is nicely balanced by the bitter dark chocolate shell. As for the original goal…..well, there’s always next Easter. 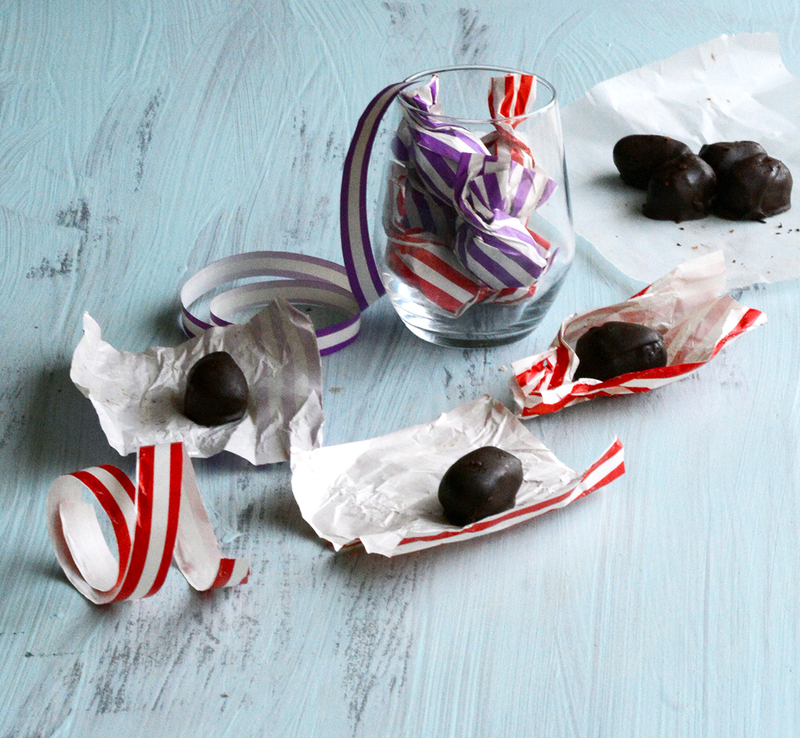 For other low-sugar chocolaty treats, try these or these. Or even these. Dip the unopened packets of coconut paste in boiling water for a couple of minutes to soften. Place the nut butter, coconut paste and syrup or honey in the food processor and blitz to a smooth paste. Transfer to a bowl and freeze for 20 mins or so until quite firm. Alternatively, you could pour the mixture into silicone chocolate moulds and place that in the freezer. If hand-shaping the eggs, remove the mixture from the freezer and using the spoon, scoop out small amounts (about a tsp) of it. Usig clean hands, knead and roll into balls, then flatten slightly to make eggs. 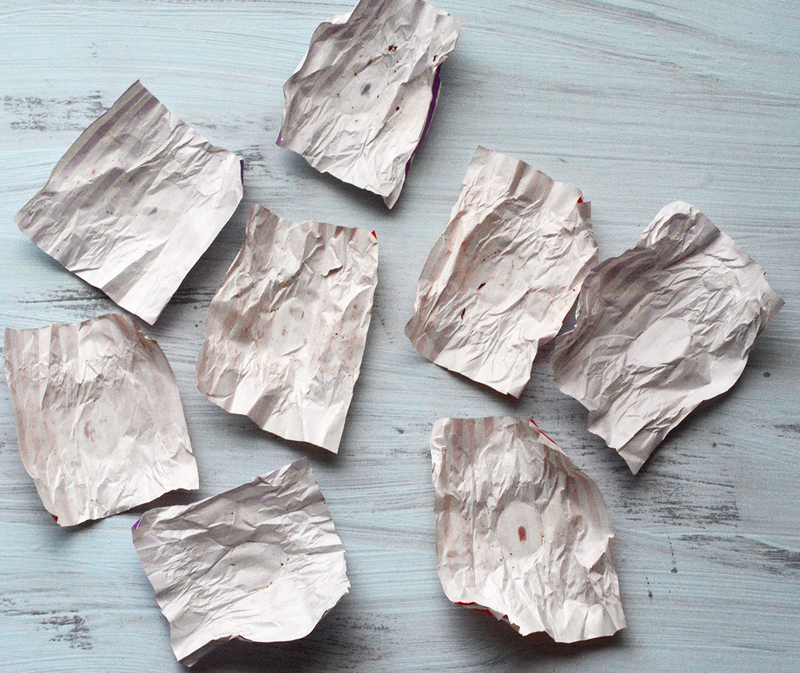 Place on grease-proof paper on a tray and freeze until very firm. 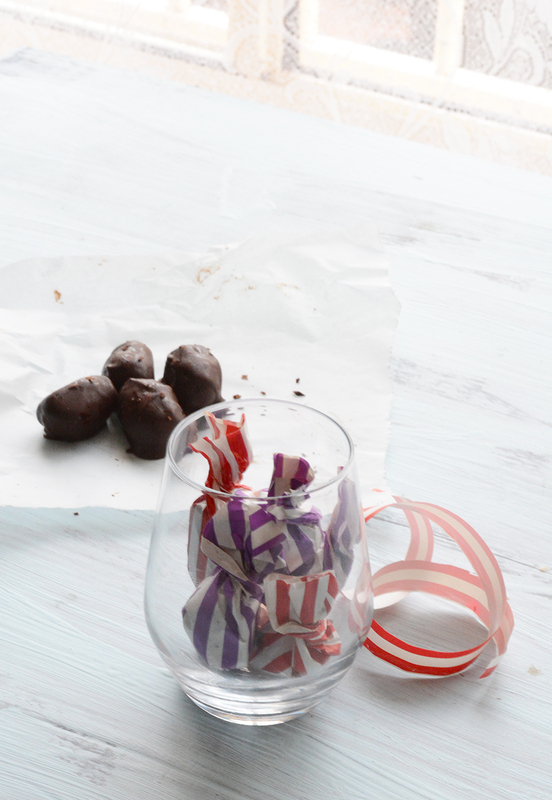 In the meantime, melt the chocolate in a double boiler or in 20-30 second bursts in the microwave. Roll the frozen eggs (or whatever shape you choose) in the melted chocolate. 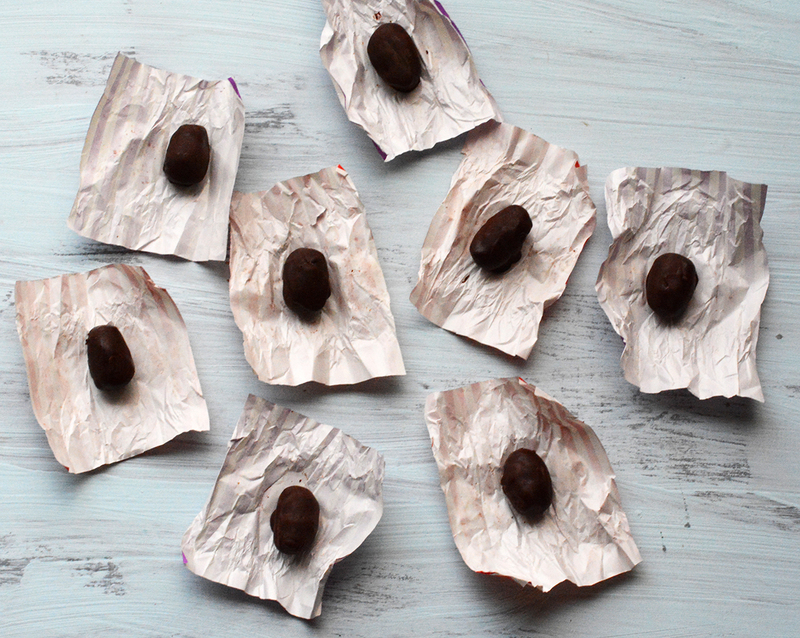 Use a couple of spoons to cover the eggs in the chocolate and place back on the grease-proof paper lined tray. Refrigerate until the chocolate is set. If you would like to make your own nut butter, find the method here. You will need about 1/2 cup of nuts to make 1/4 cup of butter. I found coconut paste in the Asian food section of large supermarkets. I found it in a box of 5 sachets of 50 grams each. I believe it is also available in some Asian grocery stores (thanks for the tip JJ! ).